To load or reload in any amount from $5 to $500. Purchase of card constitutes acceptance of the following terms: Card can be used for merchandise purchases only at any of the stores listed on this card, non-merchandise purchases (e.g. gift cards, money orders/transfers, lottery) are not allowed. Card may be used multiple times until value is depleted and cannot be redeemed for cash except where required by law. Funds will not be replaced on Lost/Stolen cards and Safeway Gift Card LLC is not responsible for use of card without your knowledge. Card does not expire and has no fees. For card balance call 1-888-413-5003. Card can be used at any Albertsons, Acme Markets, Andronico's Markets, Safeway, Randalls, Tom Thumb, Pavilions, Vons, Carrs, Shaw's, Star Markets and Jewel-Osco. In California, Tom Thumb is not a Safeway company. Issued by Safeway Gift Cards, LLC. 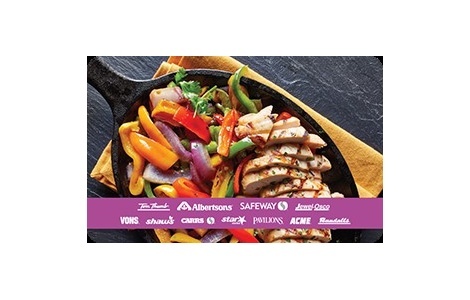 Distributed by Blackhawk Network, Inc. ©Safeway Gift Cards LLC. All rights reserved.